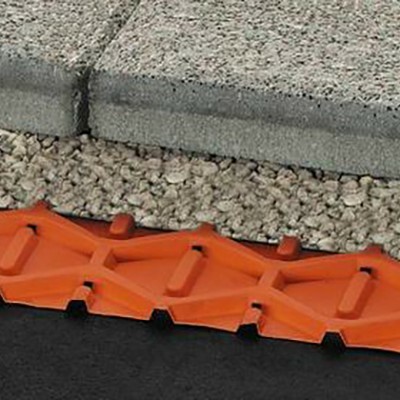 Schluter-TROBA consists of a pressure-stable polyethylene sheet that contains a series of trapezoid-shaped, 6 mm high, studs. To allow for the penetration of seepage water, the corners of the studs are equipped with holes. The contact area of the matting is approximately 50%; free space constitutes the remaining 50%. The material will not rot and is form-stable within a temperature range of -40 °F (-40 °C) to 176 °F (80 °C). 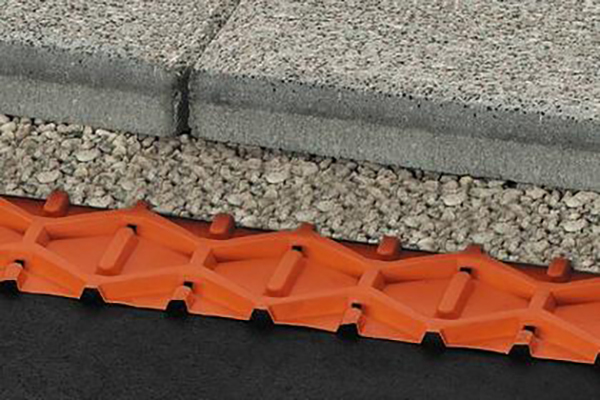 Schluter-TROBA is used primarily in horizontal applications over sloped waterproofing layers. 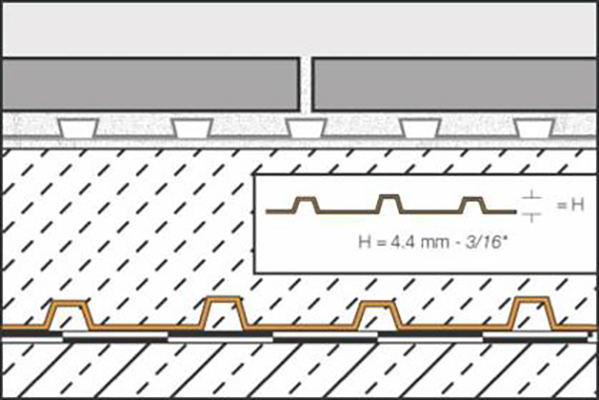 One of the great benefits of Schluter-TROBA is that it provides an effective drainage layer between the waterproofing layer and the covering assembly above. This system is generally used on balconies and terraces, but its applications also include industrial structures, swimming pool decks, washrooms, showers, etc. (all of which have been waterproofed). The loosely placed Schluter-TROBA is manufactured to be adequately resistant to mechanical stresses incurred during the installation process; i.e., due to foot traffic and wheelbarrows. The load-distribution layer may consist of a mortar bed with or without a tile covering, or it may be constructed of crushed stone or gravel with a paver or stone covering. It is also possible to apply a covering of soil. Any water that penetrates the covering is collected in the stilted drainage area of Schluter-TROBA where it runs off, under normal gravitational force, toward the designated drainage exit. Thus, permanent saturation of the load-distribution layer, due to seepage water, is eliminated. The load-bearing substrate and waterproofing membrane must be flat and adequately sloped toward, and connected to, the designated drainage exit. 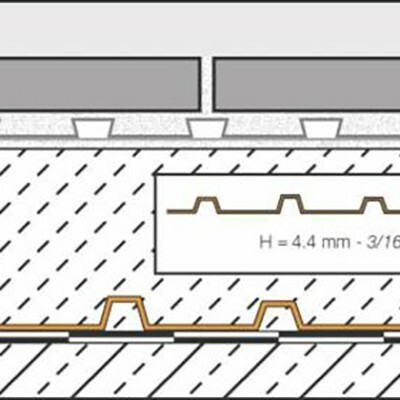 Irrespective of slope, Schluter-TROBA is loosely laid over the waterproofing membrane. Individual courses of Schluter-TROBA are overlapped along the flat edges while the ends of two courses are overlapped by at least one row of studs.